cardigans and kids: peacoat pullover. 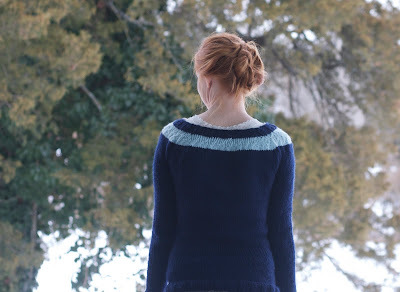 Knit in Quince and Co.'s puffin. And thanks to help from Christine, it is finished. I was about to run out of yarn before the end and I was stuck. She had the idea to use another color. I had some glacier in puffin... and now it is finished! It was on my needles way too long for being size 10 1/2's. More details over at ravelry if interested in the knitty-gritty of the construction. And tomorrow, there will be a guest blogger! I can't wait until tomorrow's post.